Next Bargaining Session Monday, April 22 and Strike Voting Continues Monday! We need the biggest turnout ever if we are going to settle the contract on Monday! Join us in Student Services Building (Racine & Harrison), Conference Room C from 9:00am to 5:00pm (possibly later: check Facebook and Twitter on Monday for updates). This is our last bargaining session before the end of the strike authorization vote! You will be able to cast a strike vote ballot at the bargaining session if you haven’t already. If you haven’t participated in the Strike Authorization Vote, your last chance to cast a paper ballot is Monday. WEST CAMPUS: School of Public Health lobby, 10:00am to 4:00pm. EAST CAMPUS: Science & Engineering South breezeway (weather permitting), 10:00am to 2:00pm. AT THE BARGAINING SESSION: in Conference Room C of the Student Services Building from 9:00am until bargaining ends. Make sure your voice heard in this important vote! 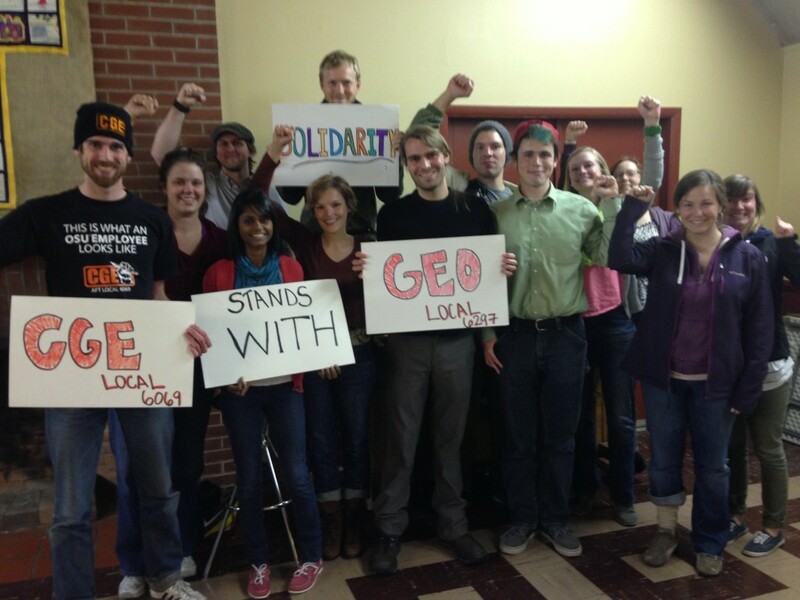 Solidarity Message from the Coalition of Graduate Employees, Local 6069!